A member of the dandelion and daisy family, tarragon has a high antioxidant content (which means that it may reduce the risk for a number of health problems including cancer and heart disease), as well as anti-inflammatory and antiviral properties. It may also help to protect liver health and improve immune function. Tarragon has been used as a home remedy to improve sleep, treat digestive upsets, and reduce water retention. However, there has not been sufficient research conducted to prove or disprove any of these claims. 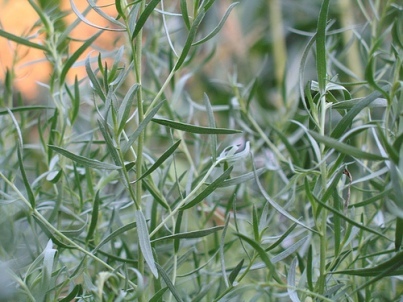 Tarragon can be used to improve the flavour of chicken, fish, and egg dishes (for example, Bearnaise sauce), as well as vegetable side dishes. It is also used to enhance sauces and vinaigrette dressings and make infused oils. Fresh tarragon is particularly nice with corn on the cob and in herb breads. For information about growing and storing tarragon, as well as tarragon recipes, see French Tarragon: Answers to Frequently Asked Questions. For a full list of healthy herbs and spices and the reference list for this information series, see the main High-Antioxidant Herbs and Spices page.